The Latin American region has seen significant social and economic changes over the past 50 years. However, it is a region with a high variation in terms of economic development and health profiles among its population. Since 1990 every country in the region has gone through a series of health sector reforms with the aim of increasing equity, effectiveness and coverage of health systems; unfortunately, despite their positive results they have not achieved the proposed goals. One of the reasons behind this situation is the absence of public health strategies. 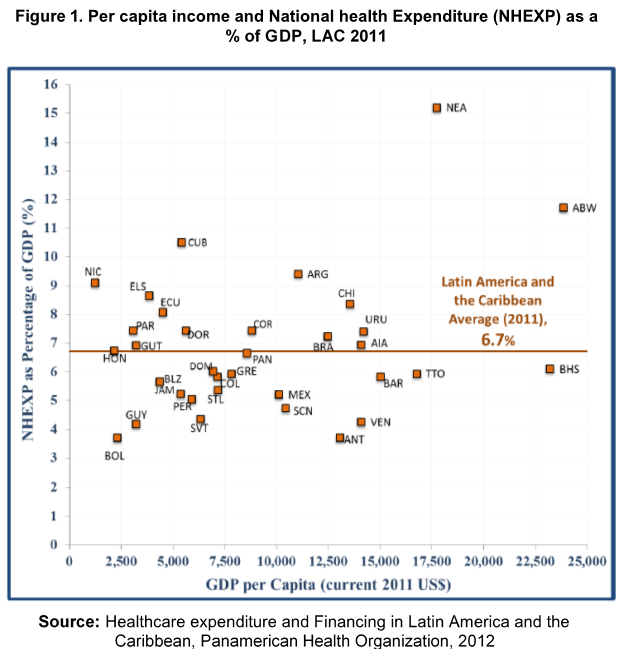 The average health expenditure (as a percentage of GDP) of Latin American countries is 6.7%, but there is a high variability in both the expenditure and per capita income in each country (Figure 1). 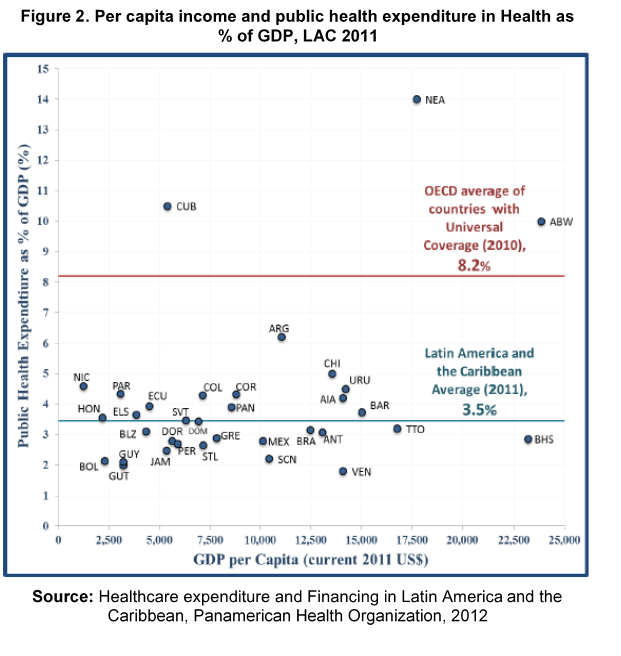 At the same time, the average investment in public health is below that of First World countries (Figure 2). How can we ensure improvement of public health in a region facing such a variable scenario in health investment and socioeconomic factors? Prioritization should be addressed within the region and within each country. We must understand that health outcomes are not based solely on the expenditure, but also in how resources are allocated according to the priorities and strategies. 1. Access to health services: Since the 90s the World Health Organization has urged countries in the region towards universal health coverage (Insurance). However, the increase in coverage has not ensured effective access to health systems. Under universal health coverage, each citizen would have access to the high quality services he/she requires. Approximately 30% of the population of Latin America and the Caribbean do not have access to health care for economic reasons and 21% do not seek care because of geographical barriers. 2. Epidemiologic transition and chronic non-communicable diseases (NCDs): During the twentieth century, the region has experienced health issues seen in many developing countries, with high levels of infectious and acute diseases placing pressure on weak public health systems. Latin American countries have advanced economically, and along with increased globalization the lifestyles of the people have changed. Life expectancy is higher and with that comes an increased burden of disease resulting from chronic and NCDs such as hypertension, diabetes, cancer, and obesity. 3. Training and distribution of human resources in health: Few countries in the region meet international indicators, such as number of doctors/nurses per 10,000 inhabitants, or hospital beds available per 1,000 inhabitants. In addition to the availability of resources, the distribution of these resources should also be taken into account. People are often concentrated in capital cities or in a few geographical areas, leaving groups outside of these areas neglected. The problem is not only a lack of resources but also poor distribution. 4. Inequalities in health: Latin America is characterized by a high level of inequity and inequality, with a significant percentage of the population in the base of the pyramid. Meaning many sections of the population are at a higher risk, as health problems are often influenced by societal factors such as education, socio-cultural level, income, and ethnicity. For example, maternal mortality rates are worse in indigenous and rural populations compared to the urban and high-income citizens. 5. Financing health systems: Changes in patterns of disease and rising aging populations increase the cost of health care. Currently health systems finance their services based on illness, which means resources have to increase as more people get sick. This mechanism becomes unsustainable because it encourages a system based on disease and not health, and for this reason over time, the system, as well as the resources would be limited. How to meet these challenges? Firstly, it must be understood that the health of a population is the result of the decisions taken at the political, economic and social level. Therefore, health problems should be solved by interdisciplinary and inter-sector action, not only by health professionals. Secondly, there must be increased investment in public health, as well as seeking alternative funding mechanisms that encourage prevention, instead of funding based on illness. This may encourage health promotion, disease prevention and healthcare from basic levels. Thirdly, health problems such as chronic non-communicable diseases must be addressed by improving primary health care and promoting healthy lifestyles. Finally, innovative solutions must be explored. Technology, social innovation, and interaction between the public and private sectors can provide solutions to the problems of access to health services. We must understand that health is a pillar of development for a country and our region must improve public health outcomes, or social and economic improvements won’t be sustainable.